Why do 8,000 people flock to see Kynren every night? The patch of land in a curve of the River Wear, below the small market town of Bishop Auckland, used to be quite bare. Today, thanks to some £35 million investment, these seven acres are the home of an epic outdoor show: staged by 1,500 local volunteers, Kynren tells a tale of English history, replete with hydraulic Norman longboats emerging from a specially made lake, Queen Boudicca’s all-female cavalry, and lashings of pyrotechnics. When Kynren launched last year, it was billed as the biggest live event in the UK since the Olympics, attracting audiences of up to 8,000 a night on raked outdoor stadium seating. That this should be staged in a deprived area of County Durham may have raised eyebrows initially, but the large-scale, annual show was always explicitly intended as a community regeneration project, encouraging tourism in the region. 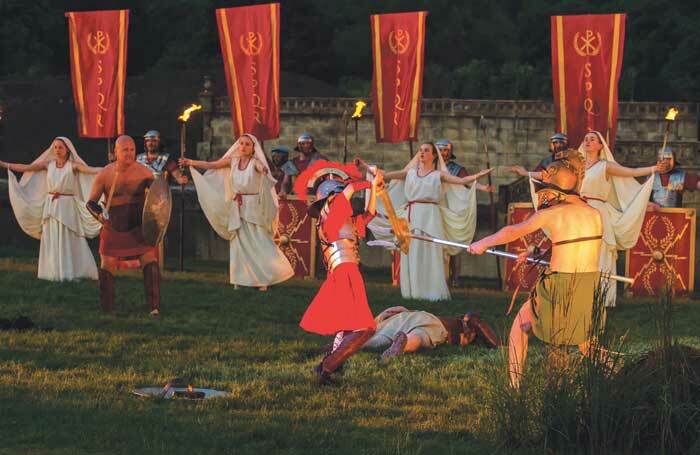 Kynren was designed to emulate the 40-year success story of Puy du Fou, where a volunteer-performed historical spectacle has become a summer institution and helped revitalise the Vendee area of western France. 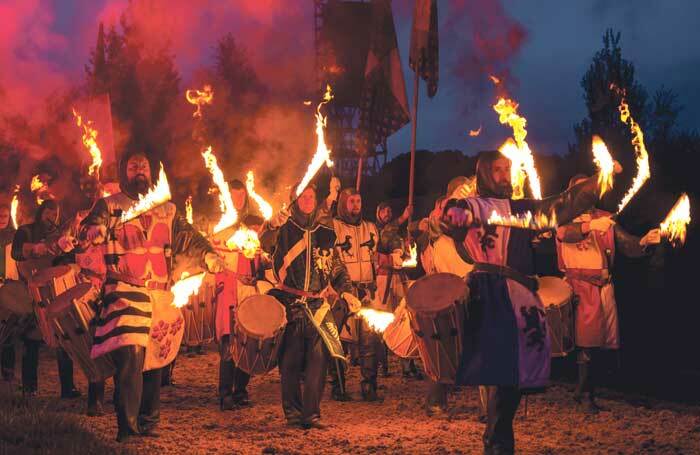 Last year, Eleven Arches – the charity established to stage Kynren – worked with Puy du Fou’s team, “borrowing” one of their producers, Damien Boissinot. 1. Both Justin Welby, the Archbishop of Canterbury, and Richard Chartres, recently retired Bishop of London, lent their voices to the production last year, as St Cuthbert and Pope Gregory the Great respectively. 2. Thirty-four performance horses star in the show: Percherons, Lusitanos, Wielkopolskis and Kladrubers. All the horses, however, must be grey – so they stand out at night. 3. A total of 436 pearls, 21 metres of fabric and 12 metres of whalebone were used in making Queen Elizabeth I’s dress. 4. Chief executive Anne-Isabelle Daulon appears as a volunteer performer in the show, playing a Roman slave and a miner’s wife, among other roles. Around 1,000 locals volunteered last summer – 80% have returned this year, and with new recruits the total number has swelled to 1,500. Those include people helping backstage and preparing props and costumes, as well as performers. Using the profits from selling 100,000 tickets last year, this year’s show has a production budget of £4 million (after that initial £35 million infrastructure investment, the show should be self-sustaining). As well as attracting new volunteers, they’re introducing surround sound, and several new scenes. 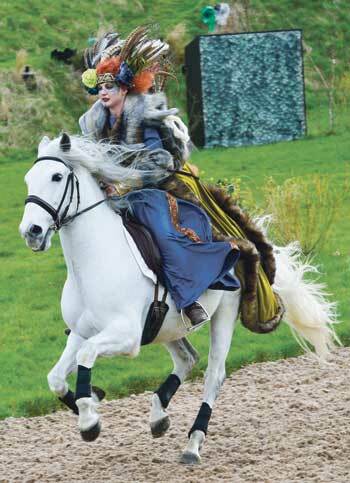 Staging moments from British history and myth, Kynren stretches from Arthurian legend to battles between the Roundheads and Cavaliers, from Queen Victoria’s Diamond Jubilee to a Second World War motorcycle chase, and features jousting, archery, a steam train and fireworks. Both a replica of nearby Auckland Castle and that Norman longboat rise out of the lake; performers dive down in advance, to stand dripping on deck as it emerges. Volunteers must be able to commit to 12 out of 17 performances, with around 800 performers to every show, meaning that no two nights will feature the same cast. Costumes must be adjustable, although with each performer having several changes per show, the total number still comes to a whopping 2,700. Kynren also features performing horses, sheep, goats and geese, not to mention 70 new teenage volunteers. 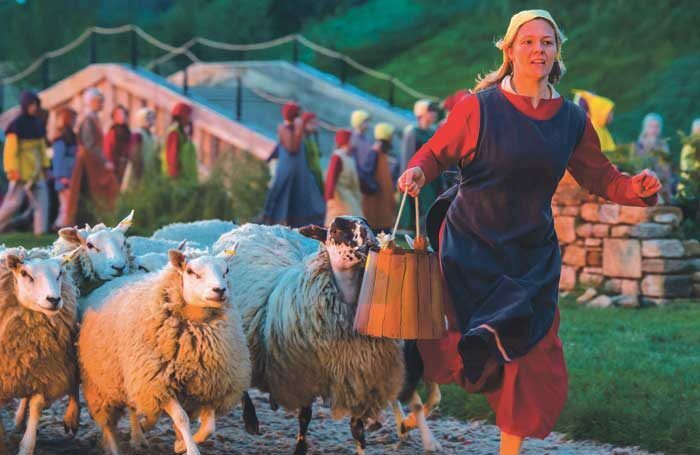 Shepherding the full Kynren flock – a task for an “army” of team leaders – is no mean feat. Looking at the vast scheduling whiteboards in their backstage ‘village’, it’s a logistical challenge that could make your head ache. 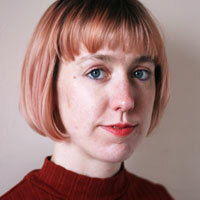 But even visiting in February, there’s a palpable sense of excitement about the place too. 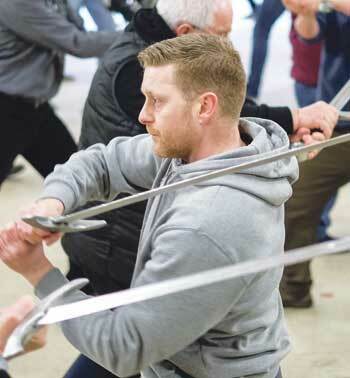 In a series of vast sheds, performers begin to prep – in one, a few dozen middle-aged men learn how to swordfight, diligently matching their steps to their weapon-swinging, while a hundred kids master mass-choregraphed Lindy Hop next door. Boyd’s workshops run on the basis that in just nine hours, an individual can master the necessary routines. And the aim is that Kynren should give volunteers a sense of achievement through learning new skills, as well as strengthening community bonds. Community shows often struggle with the push-pull of process versus product: is it more important that your participants get something out of it, or your audience? They did better than they’d hoped for in ticket sales in 2016, even adding an extra date. And although the show itself saw some critics sniffing at an overly simplistic, flag-waving account of British history, its scale and sense of spectacle was widely praised, with reports of nightly standing ovations. Still, there was some scepticism in the community at first. Ruffer was an outsider – and his journey to community-theatre maven is an unlikely one. A series of paintings at Auckland Castle by Spanish master Francisco de Zurbaran were about to be sold to foreign buyers in 2010; when Ruffer stepped in, he found the castle thrown in with the sale too. To help get them on side, Eleven Arches initially approached around 15 locals to act as ‘ambassadors’, taking them to Puy du Fou. One ambassador was Mark Rossi, an art teacher in a local school, St John’s, now team leader in the props department and ‘captain of painting’. While showing me hundreds of swords and shields he’s helped volunteers create, he recalls the wary reactions some initially had.